Cannot be Special Summoned from the Graveyard. Negate the effects of monsters destroyed by battle with Fiend-Type monsters you control. This monster appears in the artworks of Flash Effect, Leading Question, Victim Barrier, A Deal with Dark Ruler, Bark of Dark Ruler, Demotion, Destruct Potion, Hate Buster, Order to Smash, Sinister Yorishiro, Skill Drain, The Puppet Magic of Dark Ruler, and Trading Places. This monster's hand appears in the artwork of Soul Demolition. Based on the artworks of Demotion, Hate Buster, Mind Drain, Skill Prisoner, etc., this monster is enemies with Dark King of the Abyss. This monster is the boss of Opticlops (see the card's lore), Winged Minion (see Victim Barrier and the OCG name of Winged Minion), Dark Resonator (see Mind Trust), and Berserk Dragon (see A Deal with Dark Ruler). After it becomes Revived King Ha Des, it also gains power over Archfiend Zombie-Skull (see Reanimation Wave). Ha Des is a pun on the name Hades, the name of the Greek god of death and the underworld (which is called Hades as well). The Japanese title 「冥界の魔王　ハ・デス」 contains an interpunct 「・」 between Ha 「ハ」 and Des 「デス」, showing that it is actually two words. This was probably intended to be a pun, because the Japanese spelling of the word death is des (which is also used in Desrook Archfiend and Des Lacooda). This card has a Zombie Synchro counterpart, Revived King Ha Des. Amazoness Fighter: The effect of this card is applied even when it is attacked by "Dark Ruler Ha Des" or a monster equipped with "Wicked-Breaking Flamberge - Baou". Chimera the Flying Mythical Beast: If "Chimera the Flying Mythical Beast" is destroyed by "Dark Ruler Ha Des" or another Fiend-Type monster you control while "Dark Ruler Ha Des" is on the field, its effect to Special Summon is negated. Kuribon: You can activate this effect when “Kuribon” is attacked by “Dark Ruler Ha Des.” “Dark Ruler Ha Des” will not negate the effect because it is activated before “Kuribon” would be destroyed. Wattwoodpecker: If "Wattwoodpecker" battles "Dark Ruler Ha Des" and would be destroyed, "Wattwoodpecker’s" effect is still applied. If a monster like "Dark Ruler Ha Des" or "Revived King Ha Des" destroys a monster by battle, then the monster's effects are no longer negated if the monster leaves the Graveyard. Thus, if "Summoner Monk" is destroyed by battle with "Dark Ruler Ha Des" and is then Special Summoned from the Graveyard, its effects are no longer negated, so you can Special Summon a Level 4 monster from the Deck. : After Summoning a monster which was destroyed by battle with "Dark Ruler Ha Des", if the monster's effect activates, is it negated? 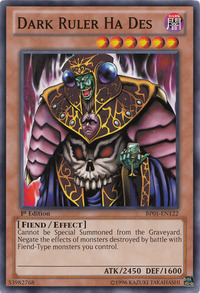 Gemini monster: When "Dark Ruler Ha Des" destroys a Gemini Monster by battle and sends it to the Graveyard, that monster's effect is negated and it is treated as an Effect Monster while in the Graveyard. : When "Dark Ruler Ha Des" destroys a Gemini Monster, is it treated as a Normal Monster while in the Graveyard? Grapha, Dragon Lord of Dark World: If "Grapha, Dragon Lord of Dark World" is destroyed by battle by "Dark Ruler Ha Des", then you cannot Special Summon "Grapha, Dragon Lord of Dark World" from the Graveyard by its own effect. : If "Grapha, Dragon Lord of Dark World" is destroyed by battle with "Dark Ruler Ha Des", can you Special Summon it from the Graveyard by its own effect? This card's effect includes itself, as long as it remains a Fiend-Type monster. Flip Effects and effects that activate in the Graveyard WILL be negated. This includes "Sinister Serpent", "Sangan", "Witch of the Black Forest", "Marie the Fallen One", "Mystic Tomato", "Giant Rat", "Masked Dragon", "Magician of Faith", "Man-Eater Bug", "Nimble Momonga", "Twin-Headed Behemoth", etc. Monster effects that activate after damage calculation will be negated if your Fiend-Type monster destroys the opposing Effect Monster. Examples include "D.D. Warrior Lady", "Thousand Needles", "Slate Warrior", "Ryu Kokki", and "Wall of Illusion". 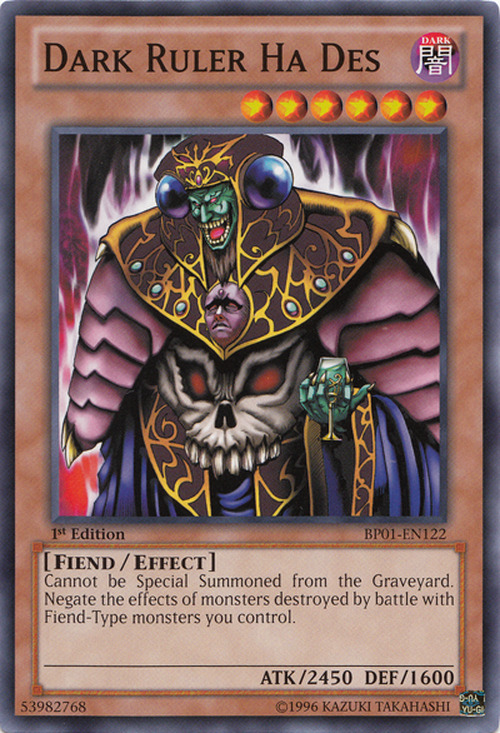 If an Effect Monster, destroyed by a Fiend-Type monster while "Dark Ruler Ha Des" is on the field, is returned from the Graveyard to the hand or Special Summoned from the Graveyard, its effect will be active again. Its effect may be negated again if destroyed by "Dark Ruler Ha Des" or another Fiend-Type monster. If one of these Effect Monsters is removed from play (by "Soul Release" for example) and then returned to the Graveyard with "Miracle Dig", the negation condition was lost and the effects will now be active. If "Kiseitai" is attacked by a Fiend-Type monster while "Dark Ruler Ha Des" is on the field, its effect prevents damage calculation, so it is not destroyed and its effect is NOT negated. If "Sinister Serpent", "Twin-Headed Behemoth", or "Marie the Fallen One" is destroyed by a Fiend-Type monster when this card is on the field, they will not activate on any following turn. So during your opponent's next Standby Phase, and each of their following Standby Phases, they may NOT move "Sinister Serpent" to their hand, Special Summon "Twin-Headed Behemoth", and they will NOT gain Life Points by the effect of "Marie the Fallen One". This negation continues even if "Dark Ruler Ha Des" is later removed from the field. If your Fiend-Type monster battles with "Relinquished" equipped with a "Sangan" or a "Witch of the Black Forest" and the equipped card is destroyed instead of "Relinquished", the effect of "Sangan", etc., will activate since it was the effect of "Relinquished" that destroyed it. It was not destroyed as a result of battle with the Fiend-Type monster. If your "Dark Ruler Ha Des" or other Fiend-Type monster destroys "Tyrant Dragon" as a result of battle, a Dragon-Type monster must still be Tributed when "Tyrant Dragon" is Special Summoned from the Graveyard. This is because Tributing a Dragon-Type monster is a condition on the Summoning of the card; it is not part of the effect. For the same reason, if a Spirit Monster is destroyed by a Fiend-Type monster when "Dark Ruler Ha Des" is on the field, it still cannot be Special Summoned from the Graveyard. Also if two "Dark Ruler Ha Des" destroy each other in battle, neither can be Special Summoned from the Graveyard. "Dark Ruler Ha Des" cannot be Special Summoned from the Graveyard even if you try to Special Summon it face-down by the effect of "Spear Cretin" or "The Shallow Grave". You can activate "Return of the Doomed" to return "Dark Ruler Ha Des" to your hand during the turn which it was destroyed, because this does not Special Summon it, it merely returns the card to your hand. The effect of "Fiber Jar" will shuffle "Dark Ruler Ha Des" back into your Deck even if "Dark Ruler Ha Des" is in the Graveyard and cannot be Special Summoned. "Dark Ruler Ha Des" may be Special Summoned by "Dimension Fusion" or "Return from the Different Dimension" if it was removed from play. D.D. Scout Plane:" If "D.D. Scout Plane" is destroyed by "Lesser Fiend", "D.D. Scout Plane"s effect activates and it is Special Summoned even if "Dark Ruler Ha Des" was also in play when it was destroyed. Dark Balter the Terrible:" This card's effect to negate the effect of Effect Monsters that it destroys as a result of battle is a separate effect from the other one; you do not pay Life Points to activate it. This effect works the same as the effect of "Dark Ruler Ha Des"; see that card's rulings for more details. Dimension Distortion:" "Dimension Distortion" can Special Summon "Dark Ruler Ha Des". Dimension Fusion:" Dimension Fusion can Special Summon "Dark Ruler Ha Des"
Doomcaliber Knight: If your "Doomcaliber Knight" attacks an Effect Monster with a non-continuous effect and destroys it while you control "Dark Ruler Ha Des", when the Effect Monster's effect activates "Doomcaliber Knight's" effect is still chained. Elemental HERO Necroid Shaman:" You cannot choose to Special Summon a monster if it cannot be Special Summoned, such as"Dark Ruler Ha Des"
Felgrand Dragon‎: The text "“This monster cannot be Special Summoned except from the Graveyard, and only if it was sent there from the field”" is a condition and not an effect. It cannot be negated by "Dark Ruler Ha Des", etc. Getsu Fuhma:" If "Getsu Fuhma" is destroyed by "Dark Ruler Ha Des", "Getsu Fuhma"s effect is not activated. Guardian Tryce:" You cannot Special Summon "Dark Ruler Ha Des" with "Guardian Tryce"s effect. Gyroid:" If "Gyroid" is attacked for the first time in a turn by "Dark Ruler Ha Des", "Gyroid"s effect is not negated because it will not be destroyed. Heavy Mech Support Platform:" If "Reflect Bounder" equipped with "Heavy Mech Support Platform" is attacked by "Dark Ruler Ha Des", during damage calculation "Heavy Mech Support Platform" is destroyed instead of "Reflect Bounder". Then, after damage calculation, "Reflect Bounder" will destroy itself by its own effect. Its effect is not negated, because it was not destroyed by "Dark Ruler Ha Des". Obnoxious Celtic Guard:" If "Obnoxious Celtic Guard" is attacked by "Dark Ruler Ha Des", or another monster that negates a card's effect after it destroys it, "Obnoxious Celtic Guard" is not destroyed (so its effect is not negated). Question:" If a monster is named with "Question" that could not be Special Summoned, "Question"s effect disappears and the monster is neither Special Summoned nor removed from play. So the effect of "Question" disappears if the bottom monster is incorrectly named and is"Dark Ruler Ha Des"
Reflect Bounder:" When "Reflect Bounder" is attacked by "Dark Ruler Ha Des", "Reflect Bounder" inflicts its effect damage, damage calculation is applied, "Reflect Bounder" is determined to be destroyed as a result of battle, "Dark Ruler Ha Des" negates "Reflect Bounder"s effect, and "Reflect Bounder" does not destroy itself with its own effect, however it was still destroyed as a result of battle. Sinister Serpent:" If "Sinister Serpent" is destroyed as a result of battle with "Dark Ruler Ha Des"you cannot activate its effect and return it to your hand during your next Standby Phase, or any subsequent Standby Phase. Spirit Reaper:" If "Spirit Reaper" is attacked by "Dark Ruler Ha Des", "Spirit Reaper" isn't destroyed during damage calculation, so the effect of "Dark Ruler Ha Des" does not activate. Vennominaga the Deity of Poisonous Snakes: If this card is destroyed by battle with "Dark Ruler Ha Des", "Dark Ruler Ha Des" effect negates this card's effect in the Graveyard, and it cannot be Special Summoned. Vennominon the King of Poisonous Snakes:" If this card is destroyed by battle with "Dark Ruler Ha Des", "Dark Ruler Ha Des" effect negates this card's effect in the Graveyard, and it cannot be Special Summoned. Yomi Ship:" If destroyed by "Dark Ruler Ha Des", etc., the effect of "Yomi Ship" is negated. Zoma the Spirit:" When "Dark Ruler Ha Des"Skull Zoma" by battle, its effects are negated and it will not inflict damage. If "Dark Ruler Ha Des" battles with "Relinquished" equipped with a monster (with lower ATK than "Dark Ruler Ha Des's"), then "Relinquished's" effect that destroys the equipped monster instead, and the effect that inflicts damage, are not negated by "Dark Ruler Ha Des". : Dark Ruler Ha Des Vs. Relinquished, Etc.